A while ago, I wrote about King Gustav III’s beautiful Haga Park. The park that I wrote about is gorgeous, popular, and truly stands out as one of Stockholm’s finest green spaces. In this post, however, I am going to present the less successful sides of Haga Park. In many cities even these less impressive areas would be valuable and beautiful green spaces, but compared to Stockholm's other beautiful parks, and especially being adjacent to Gustav III's Haga Park, these areas just can't quite compare. 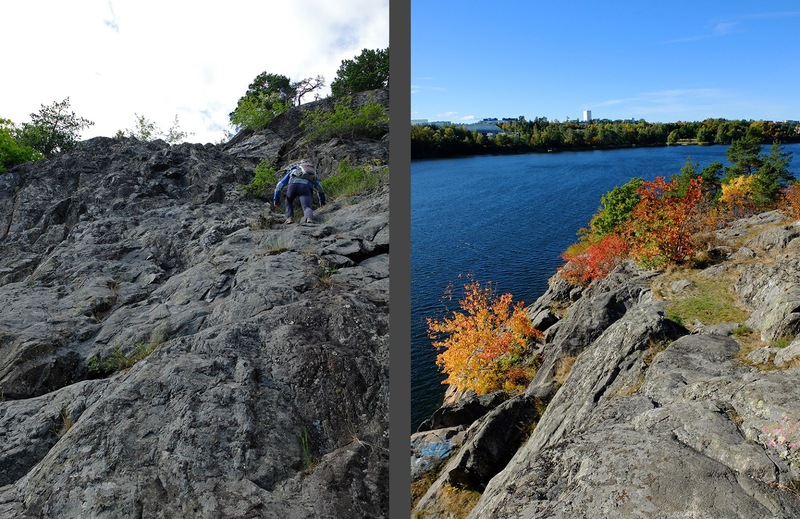 In this post I'm going to address why I think these other areas don't live up to their full potential and what changes could be made to better integrate them into Stockholm's park system. 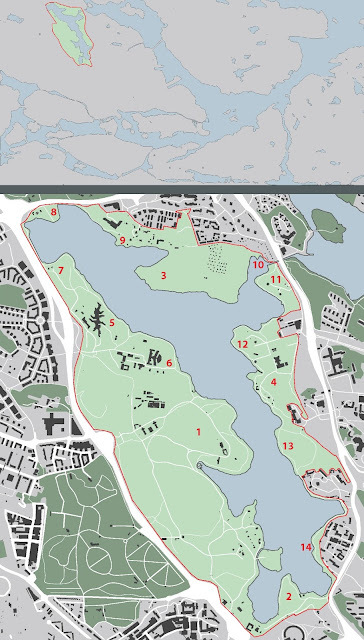 While Haga Park (map 1) is officially only on the west bank of the Brunnsviken bay, the green space more-or-less wraps around the entire 3.5 km long bay in one long, continuous park. Certain parts of the park are landscaped and manicured while others are more-or-less naturally wild. Still other parts are simply just neglected. A ~10 kilometer-long trail follows the water’s edge all the way around the bay. This trail varies from gently sloping gravel walks in Haga Park to boardwalks at Bergshamra to cliff climbs at Tivoli to forest paths at Frescati. While it is possible to circumnavigate the bay, several psychological and physical barriers make circumnavigation seem daunting. First, while there are trails on either side of the cliffs at Tivoli, there is no real trail between the waterside trail and the clifftop. 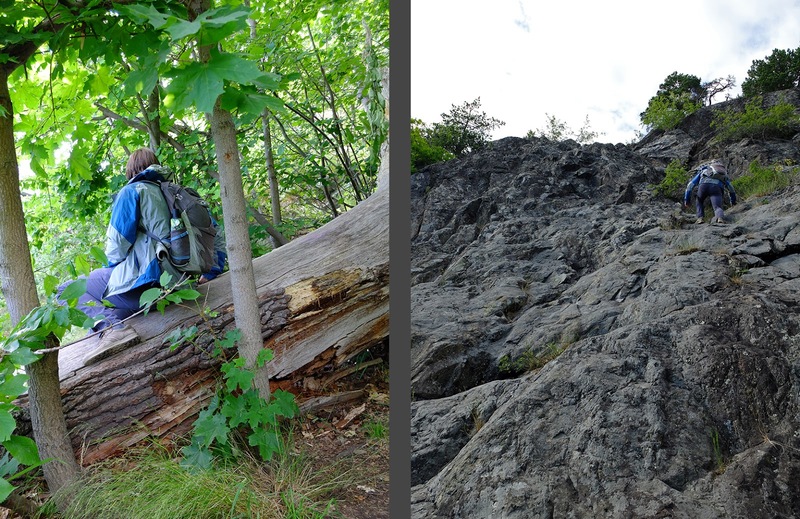 One is either forced to climb up the cliff face or to bushwhack through the steep undergrowth. Secondly, the bay’s outlet at Ålkistan canal is bridged, but pedestrians are forced up onto the highway’s bridge in an awkward series of hard-to-find stairs and somewhat murky passages under the bridge. Additionally, the green space is completely surrounded by busy and noisy highways. While one is never out of earshot of the highways, one cannot see the highways for most of the circumnavigation. However, at the northern end of the bay, the highway skirts the water’s edge and pedestrians are forced onto a sad bit of trail that is hemmed in by the busy highway—hardly a relaxing or beautiful experience. The southern side of the green ring is also fragmentary with a thin layer of greenspace between the water and the railroad tracks and highway, and the trail in this area is less than obvious and can be difficult to piece together. Another strange factor is that while there are posted maps of the various areas around the bay, I have never seen a trail map that shows the entire interconnected network of trails and sights of interest. 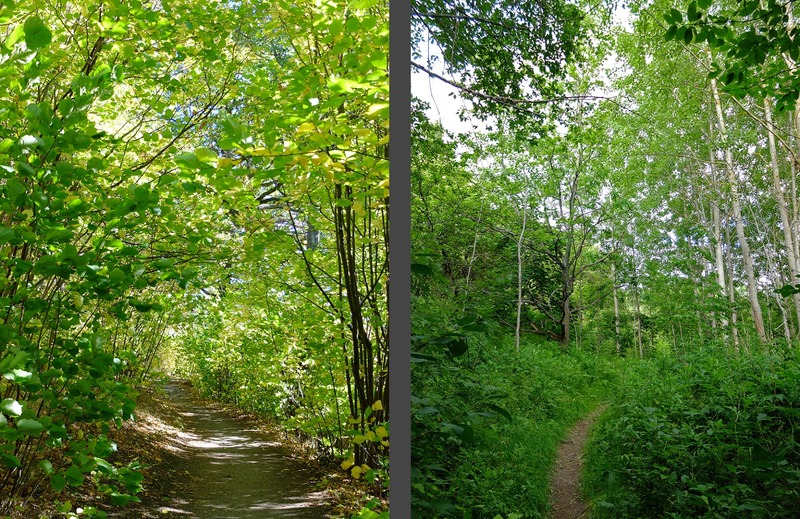 I am guessing that this is due to the fact that the green spaces are technically in two different municipalities (Stockholm and Solna) and that the municipalities don’t work together to maintain a connected network of trails, but why is this the case? Why can’t/don’t the municipalities collaborate to create and maintain a contiguous park around the bay? It seems that such a large, contiguous green space is especially valuable when it is only two blocks from downtown! Why are some parts of this green ring so beautiful and some parts so neglected? What would it take to create and maintain a coherent park all the way around the Brunnsviken bay? The less successful areas of the park stem from a grandiose, 230 year-old scheme that was doomed to failure. King Gustav III’s first purchase of land at Haga was originally just one farm, but as his visions for the park and palace grew and grew, he purchased several of the adjacent properties. Eventually, his grand scheme developed to the point that he saw Brunnsviken bay as the center of a wheel of English parks—the ring of parks was envisioned as a green belt around the water. However, the king didn’t have the means to acquire all of the land around the bay, so he began to encourage his friends and family members to purchase property and to develop it according to his grand plan. While travel overland from one side of the bay to the other was quite far, by water the trip was a matter of minutes. 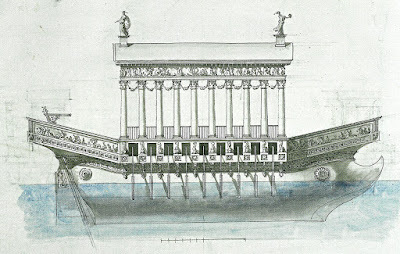 Even before his friends and followers began to buy the surrounding properties, architect Louis Jean Desprez began to draw imaginative “gondolas” for the king’s romantic vision of visiting friends by boat. Two boats were actually built, The Dolfin and The Boar. Drawings for several other boats including a temple and a viking dragon have survived, but these were never built. Needless to say, many people were eager to become the King’s neighbor and to have such intimate access to the King’s ear. However, the late 1700’s was an economically weak period in Sweden’s history and very few people had the money needed to purchase large tracts of land much less to develop it into English parks. Parliamentarian and Governor of Stockholm Carl Sparre was the first to try. His purchase of Pasch's Malmgård (suburban farm, see #18 here) was approved by the king. Unfortunately, the property was saddled with debt and its buildings were in poor repair, but Sparre further indebted himself by building a second large residence on the property. Due to a steep ridge jutting out into the water, the King named the property Bellevue. The house on the left was built by Pasch, the house on the right by Sparre. The year after Sparre purchased the property, the King went on a long grand tour through France and Italy, and Sparre was requested to join. He was away while the house was built, and upon his return, he turned his focus from the house to the property at large. In 1784 he hired Fredrik Magnus Piper, the same landscape architect who designed Haga Park for the King, to design an English park for the Bellevue property. Like Haga, Bellevue’s design is characterized by site lines from one folly to the next, all placed on high points around the property. The site lines crossed from Bellevue into Haga, and Piper developed both parks together. One folly that Piper designed was a castle with a salute battery for one high point and he planned to place a round temple (designed earlier by Palmstedt) on the ridge point jutting out into the water facing Haga. Neither were built but a Chinese parasol was built out on the ridge point instead. In addition to the follies, meandering paths for walking and for riding were designed to navigate the steep pitches up and down the cliffs. In places, the cliffs were dynamited to allow a more gentle approach. Earth was moved to provide dirt for grassy fields and hundreds of trees were planted in clumps around the large lawn to create a park-like setting. Sparre died in 1791 and work on the park halted. The king bought the debt-riddled property and gifted it to his brother Duke Karl on the condition that the duke pay off the property’s debts and continue to develop the park according to Piper’s plans. The King even designed a palace to be built (at the Duke’s expense) on the great lawn between Bellevue and Haga. The duke, however, was strapped for cash and was forced to refuse the gift. The park was never fully realized. Today, the area feels parklike, but it is disconnected from Haga, a park amidst the traffic. Left: One of Piper's steep tree-lined paths leading up to the crown of the ridge. Right: The Chinese parasol marks the view point overlooking Brunnsviken bay. After the King’s trip through Italy, all of the newly acquired areas around Brunnsviken bay were given names inspired by Italy. Interestingly, though, the landscaping ideals remained inspired by romantic English gardens instead of the more formal Italian gardens. Tivoli was the first of these properties to be developed. Court favorite Gustaf Philip Creutz was a successful poet who rented land from the Crown at the bay’s northern end. He hired Piper in 1784 to create an English park at Tivoli. 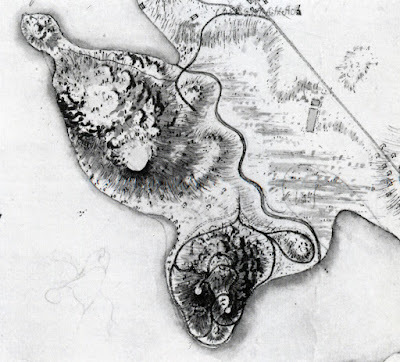 Piper’s drawings have unfortunately been lost but a survey from 1786 show that several meandering paths around and up to one of the property’s high points as well as several terraces had already been completed when Creutz suddenly died in 1785. Paths up to Tivoli's other high point were never completed; a path up the cliff is still lacking today. Like Sparre, Creutz was bankrupt and in debt when he died. The King took over the land and toyed with the idea of moving his palace to the scenic bluff at Tivoli, but he soon abandoned that idea. The paths and terraces became overgrown and were forgotten. Today, Tivoli is one of the area’s wilder sections and the King’s abandonment of the area is still felt. Burned out structures, graffitied foundations, and the lack of a trail up the cliff all speak of neglect. Abandoned structures and terraces are either covered in graffiti or completely overgrown and forgotten. Like Tivoli, the land at Frescati was owned by the Crown because it was a subsidiary farm under the Royal Palace Ulriksdal. (See "Ulriksdals Slott") In 1786, the King rented out Frescati, the area directly across the bay from the site of his palace at Haga, to Gustaf Mauritz Armfelt, a diplomat and military officer and the king’s “favorite.” It is not clear to me when the King bought Frescati or exactly what his relationship to Armfelt was. 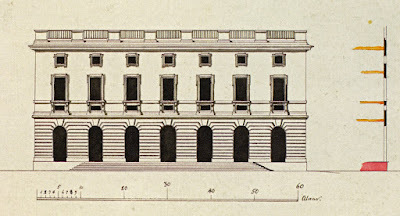 In any case, Desprez was hired in 1787 to design a royal bathing complex at Frescati. Armfelt had the temple-like main building built in 1791, but it was built as his residence instead of as a bathhouse. 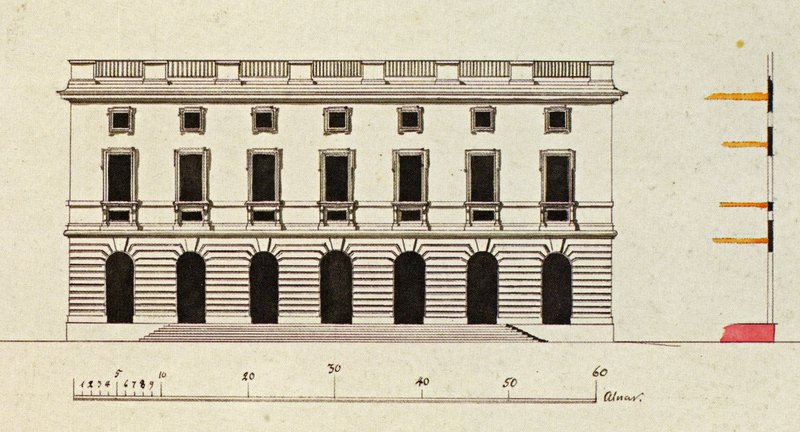 Desprez's 1787 design for the bathhouse *, and the residence that was actually built. After the King’s assassination, Armfelt was forced to flee the country, and the land reverted to being property of the Crown. In 1791, the King had plans to buy the two farms north of Haga, Annelund (map 5) and Frösundavik (map 6), in order to close the circle around the bay. However, the King was assassinated just a few months later so the properties were not purchased and no plans were ever drawn up for that part of the park. These properties are still privately owned. After Gustav III’s assassination in 1792, the future of Haga Park was assured because the park was already a popular public institution and the palace Pavilion continued to be frequently used and tended by succeeding kings. The other areas including Annelund, Frösundavik, Bergshamra, Tivoli, Frescati, and Bellevue, however, had a much more uncertain future since they were never fully anchored in either the Royal or the public spheres. Much has been built in and around the above green spaces in the intervening years between Gustav III’s assassination and the creation of Stockholm’s National City Park which includes Haga and all of the surrounding land surrounding the Brunnsviken bay. Instead of describing these intrusions chronologically I’ll go clockwise around the water, starting just north of Haga Park. Like Haga, Frösundavik was historically a farm with relatively modest buildings. The buildings were renovated in the early 1800’s in the Empire Style inspired by Haga’s palace pavilion. The farm's main house and wing. a mess hall, exercise houses, riding arenas, and houses for officers for the Army Engineers. The mess hall on the left and officer's housing on the right. This villa on the right was actually built before the military base was established. The area was de-militarized again in the 1970’s and the complex was first used as a rehab center and is now a hotel and conference center. Hotel and conference center additions to the older military complex. Several of the army buildings are in disuse and disrepair. In contrast, the waterside villas are now extremely attractive housing. Annelund was yet another farm but starting in the mid 1700’s, its proximity to Stockholm allowed it to be used as a summer residence. Around 1770, a new main house was built in the classical Empire Style. An almost barn-looking gymnasium was built in 1825 by the then-current resident who was a gymnastic fanatic. The property was bought in the 1980’s by the SAS airline which proceeded to build a gigantic office for 1400 employees in 1985. 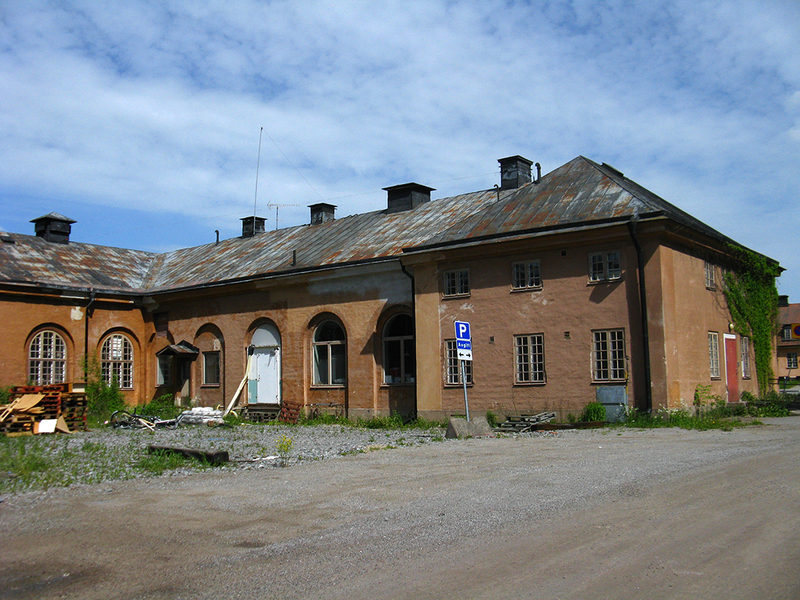 Further north is the farm Linnéaholm which was sold to the army and was used as officer’s housing when the Army Engineers occupied Frösundavik. The property was later sold to SAS. The house at Linneaholm and the view across the bay toward Bergshamra. North of Linnéaholm, the park narrows into a thin green strip between the water and the highway. Eventually, a small penninsula juts into the water. This peninsula is Karlshäll, which technically belongs to the Ulriksdal Palace estate on the other side of the highway. After Karlshäll, the trail is again a sad strip between the water and the highway. Bergshamra was a farm dating back at least to the middle ages. In the 1600’s it was incorporated into the Ulriksdal Palace estate, but it was rented out as a farm until the 1900’s. The main farm buildings have been since torn down, but the Tivoli Pavilion, built as a summer folly by one of the farmers in 1800, is still used as a private residence today. The Tivoli Summer pavilion on the left. On the right, sheep grazing in an apple orchard. The farm is still somewhat active today, I believe as a 4H (or similar) program. In the mid-1800’s, King Karl XV allowed several of his friends to build summer houses in the “Swiss” style on the hill sloping down to the water. These are now coveted residences. A colony garden was laid out in 1919; it is still popular today. Each little private garden plot has a fence and a tiny little cottage. In the 1940’s the city of Solna bought Bergshamra from the crown in order to build a new multi-family housing development. The first apartment buildings in the area and a small commercial center were built in the 50’s and 60’s. Throughout the 80’s, 90’s, and early 2000’s, additional apartment buildings and row houses were built. Some of the more recent building stock at Bergshamra. Tivoli was originally part of Bergshamra farm until Creutz rented the property in the late 1700’s. Once he died, the property was more or less abandoned, and the area still feels quite abandoned today. Sections of the "trail" at Tivoli. One of the most significant changes to Haga park was the lowering of the water in Brunnsviken in 1863. At one point in time, the bay was navigable from the Baltic, but the continuous rising of the land meant that the bay had become completely closed off from the sea and that the water in the bay was polluted and stagnant. In 1863, a canal between Brunnsviken and the Baltic was blasted through the granite and the water level in the bay sunk four or five feet. This drastically changed the park’s waterline which receded far from its original location. Gustav III’s Pavilion’s and Haga Palace’s close relationship with the water was lost. Today, there are pedestrian trails along the canal connecting up to the highway bridge above, but this area is definitely a low point on a pedestrian circumnavigation of the bay. Canal toward the bay, and toward the open water. A large portion of the land on the eastern side of the bay was eventually developed at the turn of the 19th century as part of the Institutions Belt that wrapped around a significant part of downtown Stockholm. The northern part of Frescati became a botanical garden; just east of the garden the Royal Academy of Sciences and the mammoth Natural History Museum were built. The southern and eastern parts of Frescati and Albano were donated to Stockholm’s University. In some cases the water’s edge became privately owned while in other cases the water remained under the Crown’s domain. In both cases, however, public access to the paths along the water have fortunately been maintained. I have no argument against public land being used for such noble institutions as museums, botanical gardens, and universities. (Especially when the museums, gardens, and universities are free!) However, this division of the land for uses other than the contiguous park that Gustav III originally envisioned has contributed to the scattered feel of the various areas. Even though it was built in the 1860's the round temple pavilion at Fridhem would be at home in Gustav III's Haga. Quickly one enters Bergianska Trädgården, Stockholm’s botanical garden (map 12) which was planted in 1885 (it had previously been in the northern reaches of what is now downtown). Various greenhouses and houses for the director and the head gardener and such have been added to the site over the last 150 years. The waterside path as well as all of the botanical gardens and grounds are open to the public to wander. Students are perhaps the most common demographic at the “beach” because the path becomes quite civilized again as it skirts around two university developments at Frescati and at Albano (map 14). The university buildings don’t address the water in any significant way; instead, they face in toward the university. While one can sense their presence from the waterside path below, the university buildings are generally more obvious from afar. Two university boat clubs (at least I assume that they are connected to the university) are the only real university presence at the waterside. The paths are very generous and parklike here. I will cover the Institutions Belt more deeply in a later post. After passing by Frescati and Albano, one passes by an extensive boat club with docks out on the water and wintertime boat storage up on the shoreline. Here, the “park” is again just a thin strip between the water and the highway. The park soon opens up again at Bellevue. Left: Highway/trail leading toward Bellevue. 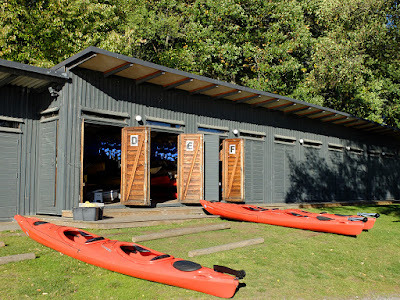 Right: Boat docks along Bellevue's ridge. Past Bellevue’s ridge, the park is again indefinite as an access road more or less takes up all of the space between the highway and the water. Eventually, one comes out to the Stallmästaregården which was originally the Stable Master’s house for Karlberg Palace. Today, it is a hotel and restaurant. Just beyond the restaurant, Haga Park opens up into a large, grassy lawn. The city of Stockholm is obviously aware of the value of a contiguous park system around Brunnsviken bay. Why would the entire area, even the privately owned properties, have been included in the National City Park? However, while the city (and the country of Sweden) may understand the intrinsic value of having such a large, contiguous park just at the edge of downtown, it does not seem able or willing to maintain all of the parts with equal enthusiasm. Certain areas of the park are gorgeously maintained while others are seemingly abandoned. My argument is not that all areas of the green space need to feel park-like with the romantic and grand, manicured lawns of Haga Park. I love that some areas around Brunnsviken feel like natural forest with rugged, rutted trails. The variation between manicured gravel walks, boardwalks, and forest trails is a large part of why I like the area so much. My argument is more about the area feeling accessible to the public than about the paths being physically accessible to everyone. Most of my Swedish friends don’t even know that it is possible to walk all the way around the bay, mostly on parkland. Because no trail map makes the entire network of paths clear, only the most curious public is incentivized to cobble together a continuous hike or run. And perhaps most importantly, because the city is obviously absent from some parts of the area, less desirable segments of the population have begun to move in. Arson, graffiti, and homeless camps all contribute to make some areas feel insecure. This creates a downward spiral—fewer and fewer “legitimate” visitors use the area which creates a more and more isolated atmosphere where vandalism and perhaps crime can thrive. Perhaps its just a matter of time. The National City Park was only established in 1994 and it is vast, encompassing 27 square kilometers or almost 7000 acres. Not to mention the twenty museums and hundreds of historic buildings which need to be maintained. The city's to-do list must be a century long. Stockholm is currently undergoing a building boom where every possible empty lot is being exploited; the city’s population is exploding which will result in both a bigger tax base and more need for green spaces. Perhaps revitalization of the park’s forgotten realms is next up on the to-do list. And perhaps, just perhaps, the sections of trails which are jammed between the water and the highways will be improved in the future. It would require taking space away from the cars and giving it to the parks instead, but a green strip of trees and dense bushes shielding the path from the traffic would do so much to improve the whole experience of the park. 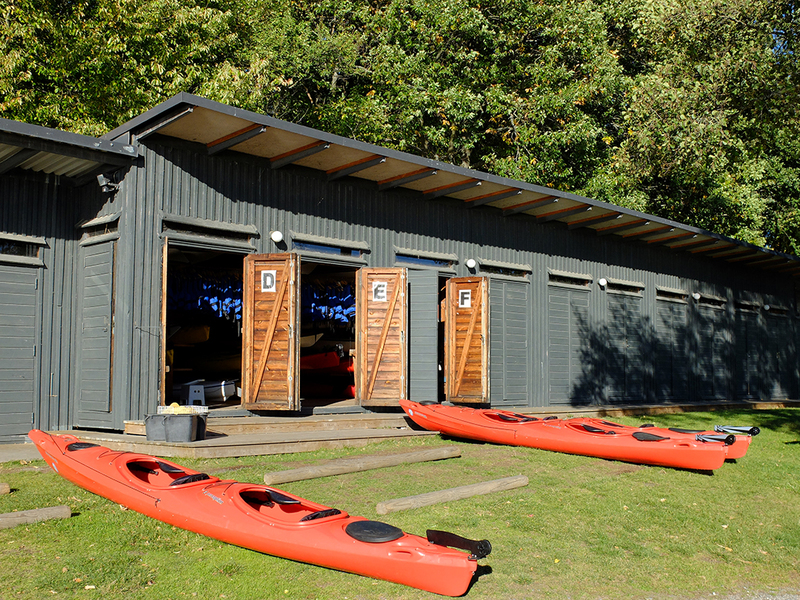 All of the necessary ingredients except for one are already in place: the park already features water, clifftops with wide open views, pine forests, deciduous forests, open meadows, trails, varied landscapes, varied trail conditions, several easy access points from public transportation, and visitors. All that is lacking is a little extra effort from the city to knit these features into a completed, contiguous fabric. My name is Beth Murphy and I am among a group of your mom's friends who are wondering how she is doing on the Camino. We have not heard from her and are hoping she is perhaps missing internet connections. We'd appreciate knowing if she is alright. Do you mind letting me know and I'll email the others? My email address is bmurphy824@msn.com. I hope you don't mind my tracking you down like this. Your blog is outstanding.